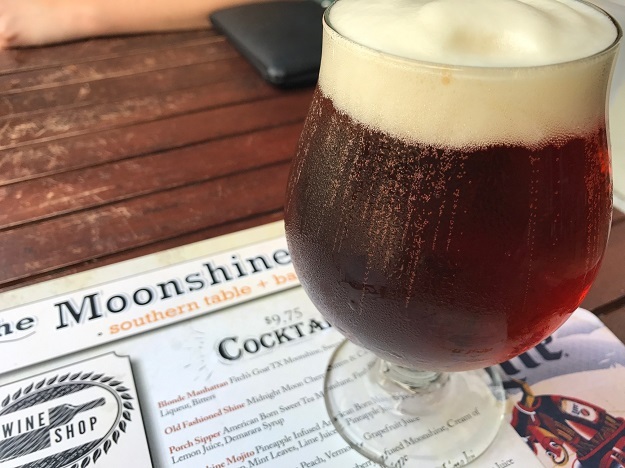 One of the first beers I had on my recent trip to the “Home of the Brave and the Land of the Free” was this delightfully-named Hopadillo American IPA by Karbach Brewing Co.
Blurb about the beer: He lurks in the shadows, waiting in bold anticipation. He’s surprisingly bitter. Bitter about something. Legend has it that he feasts on those with fresh hops coursing through their veins. Taste test: Karbach Hopadillo smacks of piney hops and grapefruit tang, with a big dollop of bitterness and no small amount of fizziness. It pours the colour of amber with a frothy white head. Hopadillo isn’t nearly as ferocious as some American IPAs (hop-heads chasing their next big thrill need not apply), but neither is it a shrinking violet either. It’s just a good, solid, easy-drinking APA. If you like this movie, you should really check out my vicious new novel ‘Slasher Sam’, a blackly-funny love letter to the slasher movie. Read it before you go offline… permanently.